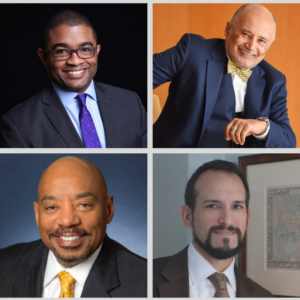 The Job Opportunities Task Force is pleased to announce the newest members to join our Board of Directors: Jamar Brown, William H. “Billy” Murphy, Jeffrey Hargrave, and Benjamin Seigel. Mr. Brown is currently an associate at Rosenberg Martin Greenberg, LLP. Mr. Brown previously served as the Assistant State’s Attorney in Baltimore and as a law clerk to the Honorable Marcella A. Holland. Mr. Brown graduated from Emory University in 2006 with a B.A. in Political Science and African American Studies and from the University of Maryland Francis King Carey School of Law with his J.D. in 2011. Mr. Brown has been awarded Order of the Barristers, member of National Trial Advocacy Team finalist in several competitions; and Maryland Super Lawyer Rising Star in 2017 and 2018. Mr. Brown serves on the Board of Directors for Pratt Contemporaries, Enoch Pratt Free Library and Court Appointed Special Advocates (CASA) of Baltimore Leadership Academy. William H. “Billy” Murphy, Jr.
Judge Murphy is the founder and senior partner of Murphy, Falcon & Murphy, the oldest minority-owned law firm in the United States. Judge Murphy’s legal expertise includes criminal defense, class actions, civil rights, and product liability and he has been in practice for over 40 years. Judge Murphy received the National Bar Association’s highest honor, the Gertrude E. Rush Award, in 2017 and has also been awarded the Clarence Darrow Award, Mass Torts Made Perfect Conference, 2012; 100 Top Trial Lawyers in the U.S., National Trial Lawyers, 2011; Top Attorney in Maryland, Baltimore Magazine Super Lawyers, 2009, 2010; Trailblazer Award, Minority Business Summit, 2009; and Thurgood Marshall Lifetime Achievement Award, 2003. Mr. Hargrave is the Founder and President/ CEO of Mahogany, Inc., a commercial construction firm specializing in architectural mill-work, general contracting, and commissioning services for 27 years. Mr. Hargrave previously served as Baltimore region Chair of Associated Builders and Contractors – JOTF’s partner in Project JumpStart – and in 2018 received the Ernst & Young award for Entrepreneur of the Year in the mid-Atlantic region. Mr. Hargrave is firmly committed to hiring locally and upgrading the skills of his employees and has also engaged in community activism to improve the lives of Baltimore City residents. Mr. Seigel was recently named as the new Baltimore Opportunity Zones Coordinator by the Baltimore Development Corporation. The Opportunity Zone initiative is a new federal program that aims to spur development in low-income communities. Previously, Mr. Seigel served as the Executive Director of Johns Hopkins University’s 21st Century Cities Initiative. Mr. Seigel also worked as a Senior Policy Advisory with the U.S. Department of Labor. Mr. Seigel graduated with his B.A. in Political Science from Swathmore College in 1996 and received a Master of Public Administration from New York University Graduate School of Public Service in 2002.